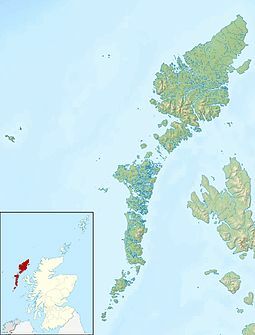 Unkent, possibly Gaelic for "westland"
St Kilda (Scots Gaelic: Hiort) is an isolatit airchipelago 64 kilometres (40 mi) wast-northwast o North Uist in the North Atlantic Ocean. ↑ General Register Office for Scotland (28 November 2003). "Occasional Paper No 10: Statistics for Inhabited Islands" (PDF). Retrieved 25 July 2007. ↑ Get-a-map "NF095995" Ordnance Survey. Retrieved 28 December 2007. ↑ Haswell-Smith, Hamish (2004). The Scottish Islands. Edinburgh: Canongate. pp. 314–26. ISBN 978-1-84195-454-7. ↑ "Protected Areas and World Heritage—St Kilda". [deid airtin] United Nations Environment Programme: World Conservation Monitoring Centre. Retrieved 18 March 2007. This page wis last eeditit on 8 Mairch 2018, at 05:35.